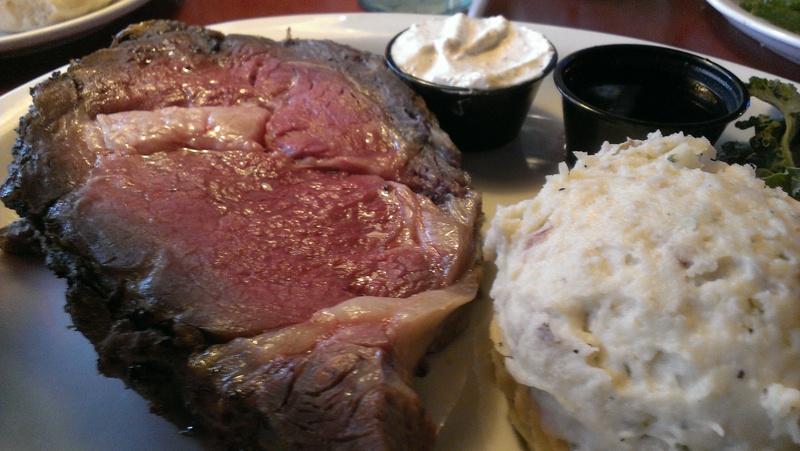 Steak lovers will have no beef with today’s food holiday: April 27 is National Prime Rib Day! Prime rib, originally known as a standing rib roast, is a cut of beef from the primal rib, one of the eight primal cuts of beef. It is called a “standing” roast because it is usually roasted in a standing position, with the ribs stacked vertically. Removing the bones from this cut and slicing it into steaks yields rib eyes. It’s unclear exactly when and where prime rib originated, but most historians believe roasts became popular during the Industrial Revolution, when hungry men desired a hearty meal after assembling widgets and other doo-dads all day long. Some cuts of meat are more popular than others, and prime rib has always been particularly sought after by beef connoisseurs. 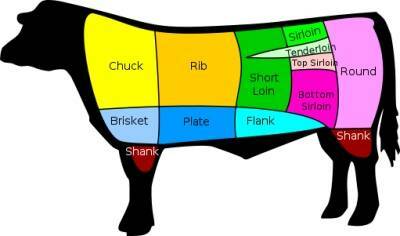 A nice slice of prime rib will contain the “eye” of the rib and the outer, fat-marbled muscle. It is typically rubbed with salt and other seasonings and slow roasted over dry heat for several hours. Prime rib is a popular “Sunday roast” in the U.K., where it is traditionally served with Yorkshire pudding. Here in the good ol’ U.S. of A., mashed or baked potatoes are popular accompaniments. April 27 also happens to be my birthday. The fact that it’s National Prime Rib Day is a happy coincidence, as prime rib is my favorite cut of steak, and I have a tradition of going to the Original Roadhouse Grill for prime rib on my birthday anyway. Or I used to, at least. It had been a few years, but today marked the perfect opportunity to reinstate that tradition. And, let me just say: the prime rib was amazing. Cooked a perfect medium rare, with an herb/salt crust, horseradish sauce, and au jus. It was to die for – the perfect birthday meal. Hope you enjoyed your birthday dinner.Did it moo? It was wonderful! And perfectly medium rare. I agree with your Mom…that looks too rare to be medium rare. Moooooo!!! Nah. It was cooked perfectly. Truly delicious!